In the weekend’s Red River Athletic Conference (RRAC) marquee series, a matchup in Marshall, Texas, NAIA No. 9 rank LSU Shreveport (La.) and HBCU Baseball Small School No. 7 Wiley College, the hosts wasted no time making a statement. The Wildcats on Friday beat the Pilots, 12-9, handing them their fifth defeat of the season. LSU Shreveport came into the weekend 27-4 and riding high. But this weekend represents their first significant test in the (RRAC) after a relatively easy start to the season. 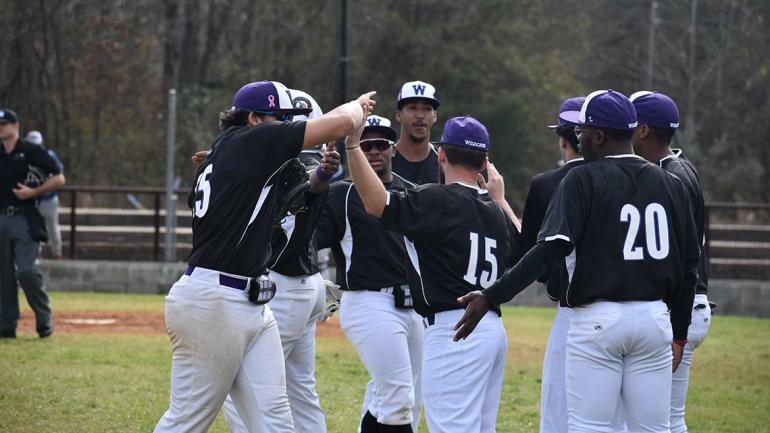 Wiley took an early lead, scoring three runs in the first inning against LSU Pilots ace Luisdiego Quintana. The Pilots’ would answer right back with three runs in the top of the second inning to knot the score at 3-3. They would add two more runs in the top of the third inning for a 5-3 lead. Wiley scored four unanswered runs for a 7-5 lead in the bottom of the third at Coker Field. The Wildcats knocked Pilots’ ace righthander Quintana out of the game having scored five runs on four hits and five walks. LSU’s potent lineup did not go away quietly. They added four runs in the top of the sixth inning grabbing back at 9-7. But, Wiley continued to beat up on LSU Shreveports’ bullpen, scoring three runs in the bottom of the sixth inning and two more in the seventh to break the game open. Every part of the Wildcats lineup got in on the fun, as they totaled 13 hits and eleven walks. Center fielder Tyler Baumann went 5 for 3 two hits with a three-run home run in the first inning and two walks to lead the way, but every starter had at least one hit or walk. Designated hitter Ruben Hancock was 4 for 2 banged two hits with two runs batted in. Wiley reliever Roman Sorrell in relief of starter Brandon Bilnoski held the Pilots, one of NAIAs top offensive teams to one hit zero runs in 3.0 innings. LSU Shreveport had five pitchers in the game against Wiley. The Wildcats came into the RRAC three-game series with some question marks. It did its best to answer those questions in the first game picking up quality win against the nations No. 9th ranked team in the NAIA Top 25 Coaches Poll. But if Wiley can now close out a series win against LSU over the next two days, they would make their biggest statement yet.